Once, a long, long, time ago when Chris and I were first dating, we were discussing where to eat. I asked innocently, “Do you like Mexican food?” We were walking at the time and when he stopped, so did I. He turned to me with a smile on his face that I imagine totally said, “Duh!” or “Really?” but because we were utterly in love, he said pointedly, “I am Hispanic.” I remember responding, “Obviously, I know that, but I didn’t want to be presumptuous to think that you liked the food.” We laughed like we do and whether or not we had Mexican food that day, I don’t recall. I do remember thinking (and still do today) that just because you grow up with a certain type of food doesn’t necessarily equate to liking it. For instance, the lineage on my mom’s side is German. We were fortunate to visit Germany twice when my oldest stepbrother was stationed in Heidelberg. I learned I don’t care for a lot of German food. I also loathe fish and water related creatures, and think if I grew up on the coast where fish, lobster, shrimp, etc. is prominent, I still wouldn’t like it. Nevertheless, he’s Hispanic and loves Mexican food. I, in turn, aim to please. 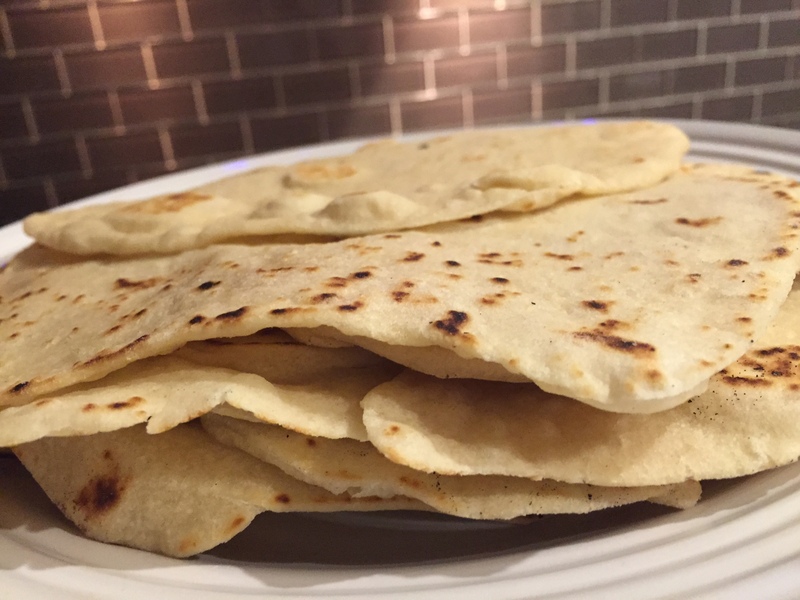 Along the way, I’ve learned a thing or two, and perfected some dishes, but I’ve always shied away from making homemade tortillas. In part, anytime we would travel back to his hometown in Texas, we would stop off at The Corner Stop down the street from his childhood home and purchase 15 packages of a dozen freshly made tortillas to take home and freeze to use until we visited again. They are hands down the very best tortillas I’ve ever had. Once his mom moved in with us due to her terminal cancer, our visits slowed substantially, but his grandmother was still there in a nursing home so he or all of us would go visit and our last stop out of town was always The Corner Stop to stock up. Once she died in the Fall of 2012 there was no real reason to make the trip anymore. The other reason I’d resisted making them was because I’d always heard of how sensitive they were. Too much flour, not enough water, or too high of a heat, and you’ve got a cracker. 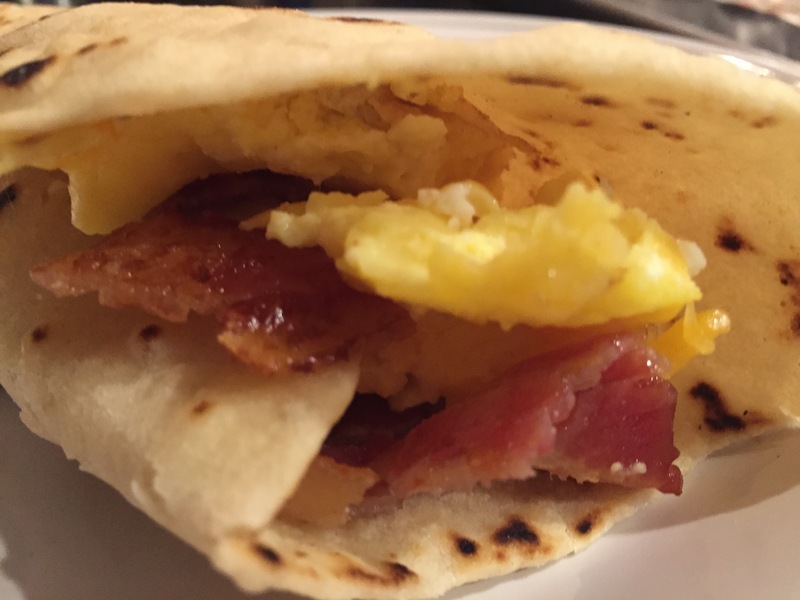 Prepackaged store bought tortillas just seemed the way to go; they’d suffice. After much research, I decided to conquer my tortilla making fears and was filled with equal parts anticipation and apprehension. When I told Chris of my intentions, he informed me the only way to make them, the way his grandmother made them, is to use lard, which we didn’t have. I told him I intended to use bacon fat. Side note: any time I make bacon, I drain the excess off into a Tupperware container that I keep in the refrigerator. The look on his face was doubtful, but really, it’s one in the same. I’m happy to report they were a success. I got the seal of approval from the girls, and most importantly, the man who grew up eating tortillas said I did good. ‘Nuff said. Add the flour, salt, and baking powder in a stand up mixing bowl and whisk together. Place a cup of water in a microwave safe measuring cup and heat for 1 minute. Using the dough hook attachment, set the speed to medium and add the bacon fat and slowly pour in the water. Allow to run for 1 minute, stopping to scrape down the sides. Once the dough comes together in a ball, reduce the speed to low and mix for another minute. Working on a well floured surface, divide the dough into 16 equal-sized balls. With the palm of your hand, flatten as much as you can, cover with a dish towel and let sit for 45 minutes to an hour. After the resting period, heat a large griddle to medium-high heat and allow to get very hot before using. Once it’s hot enough, use a well floured rolling pin and a floured surface, roll out one dough ball at a time until thin. Transfer to the hot griddle and cook for 1 minute or so before flipping to the other side for 30-45 seconds. Since every stove is different, you’ll learn quickly if you need to reduce the heat or cook longer. With mine, after the first couple of tries, I found raising the heat to almost high and cooking for a bit longer, warranted the results I was aiming for. I’d originally planned for tacos, but Bri was less than impressed so we all agreed upon breakfast burritos for dinner. I’m happy to report the tortillas remained soft and pliable. This entry was posted in Bread; Sides, Breakfast, Mexican. Bookmark the permalink.